The Prosperity Worldwide Flexible Fund of Funds, which I co-manage, continues to produce solid steady performance despite the prevailing volatile markets. The fund is ranked 3rd out of 47 funds over the last three year’s performance in its Morningstar category. 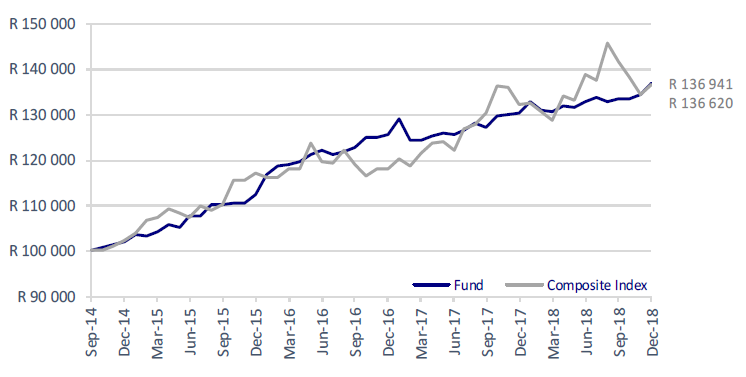 In an exceptionally difficult environment, the fund has produced a steady 7.64% per annum return since its inception in September 2014. The Fund is diversified across geographic regions, asset classes and fund managers. Its objective is to provide investors with real medium to long-term capital growth from a portfolio that maintains a moderate risk profile. The Fund is managed conservatively with an emphasis on capital preservation. The strategy is to merge the asset allocation with our macro views while taking advantage of irrational pricing across all markets and to select the best funds to enhance our views. The Fund is best suited to investors with a moderate risk profile who require a balanced local and global investment exposure with a conservative bias and capital preservation. The Fund has returned 7.64% per annum since inception – September 2014 – ahead of its benchmark. The benchmark comprises a composite, global balanced asset allocation. Over the same period of time inflation averaged 4.94% and the JSE returned 3.54% p.a. The Fund continues to be managed conservatively with an emphasis on capital preservation. The Fund finished the year with a strong performance as it returned to outperforming the benchmark since inception. Investments in gold and the Satrix 40 at strategic times drove the good performance in the 4th quarter. Tactically, we switched our government bond investments into more stable, high-yielding income funds. We maintain our view that global equity market valuations are still stretched as global interest rates continue to rise and economic growth slows. However, we see pockets of value in certain emerging markets including South Africa. As global market uncertainties persist, the Rand will remain vulnerable to fluctuations. With likely volatile markets ahead, the Fund is poised to take advantage of irrational pricing opportunities. Click here to see the latest fund fact sheet of the Prosperity IP Worldwide Flexible Fund of Funds.